Photo: Courtesy of Jayaker Yennamalla. Vedulla Kanakaiah Rufus: churchman and theologian; born 9 June 1942 in Arutla village, Ibrahimpatnam Mandal, Ranga Reddy District, Telangana State, India to Kanakaiah and Sathyamma Vedulla. He was the third child in a family of two daughters and two sons. Rufus lost his father when he was five years old. Rufus married Milka Virginia Devakrupa on 22 May 1974 at Bethany Mennonite Brethren Church (Shamshabad). Rufus and Virginia Vedulla were blessed with one daughter and two sons. V. K. Rufus died on 7 June 2003 in Shamshabad. While V. K. Rufus attending the Mennonite Brethren Mission School (Hughestown), he was baptized on 2 December 1957 at Bethel Mennonite Brethren Church (Hughestown) by Rev. D. Franz Joshua. From 1974-2003 Rufus and Virginia lived in Shamshabad, where Rufus was instrumental not only in enhancing theological education but also reaching unreached villages of Shamshabad area with the Gospel of Jesus Christ and brought many people to Christ. Moreover, Rufus played a decisive role in establishing the Mennonite Brethren Historical Archive in Shamshabad in the early 1980s. Virginia Rufus served as a teacher in the Mennonite Brethren High School (Shamshabad). Virginia also played a significant role among women. Rufus had his early education in his home village, Arutla. Later Rufus had his schooling at Mennonite Brethren Mission Schools at Shamshabad (1952-53), at Hughestown (4th to 7th standards), at Mahabubnagar (10th and 11th standards), and at the Government School (Zamistanpur, Hyderabad) (8th and 9th standards). Rufus earned several degrees – a one-year theological certificate course from Bethany Bible School (Shamshabad) in 1961, a G.Th. from Ramayapatnam Baptist Theological Seminary from 1961-1965, a BA degree from Tabor College (Hillsboro, Kansas, USA) in 1972, an MA degree in Christian Education from North American Baptist Seminary (USA) in 1973, and an M.Div. and a Th.M. degree from Fuller Theological Seminary and Trinity Evangelical Divinity School (USA) from 1989-1992. Rufus was a communicant member of Bethel Mennonite Brethren Church (Hughestown) from 1957-1966. Later in 1966 he joined Bethany Mennonite Brethren Church (Shamshabad) and remained with that church until his death in 2003. Rufus served in the Mennonite Brethren Conference of India in a number of different capacities. 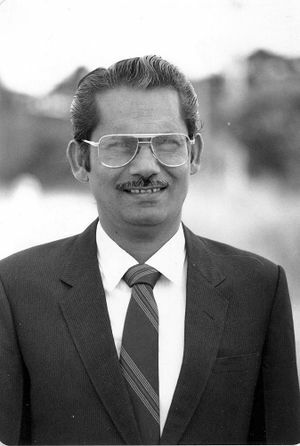 Rufus at different times served as Bible Teacher (1965-2003), Registrar, Bursar, and Principal (1980-1989, 1993-2003) of the Mennonite Brethren Bible School/College (Shamshabad). Rufus served as the first national Director of Mennonite Brethren Christian Education (1973-1980). He served as a vice-president of the Governing Council of the Conference of Mennonite Brethren Churches of India (GC) (1998-2002), Treasurer (GC), chairman of Mennonite Brethren Board of Evangelism and Church Ministries (GC), Mennonite Brethren Board of Education, Committee of Reference and Counsel and Mennonite Brethren Field Association Shamshabad. Rufus also served as the pastor and chairman of Bethany Mennonite Brethren Church (Shamshabad) (1987-1989, 2002-2003). In addition, Rufus took active participation in Mennonite Christian Service Fellowship of India (MCSFI), Andhra Pradesh Christian Council (APCC), and Mennonite World Conference. Rufus attended as a delegate at several international conferences, such as the AMB Centenary celebrations in Brazil and Reedley (USA) in 1984, Asian Mennonite Conference in Taiwan in 1985, the International Committee of Mennonite Brethren in Kansas (USA) in 1999, and Mennonite World Conference in Winnipeg in 1981. Rufus also visited Singapore, Germany, and France. Rufus was ordained on 9 December 1987, as a minister of the Word of God by the Mennonite Brethren Conference of India. “Strangers in Karnataka: Mennonite Brethren Historical Foundations.” M.Div. thesis, Fuller Theological Seminary, USA, April 1992. “Strangers in Maharashtra: Mennonite Brethren Historical Foundations.” Th.M. thesis, Trinity Evangelical Divinity School, USA, December 1992. Rufus was instrumental in establishing Sunday schools and in conducting training programs for Sunday school teachers in several places. Rufus encouraged and challenged people for ministry and laid a strong foundation for pastoral ministry. Although Rufus was highly educated he kept a model of simplicity and workmanship. Punctuality, honesty, and discipline were code words of Rufus. He stood as a role model of Christ and he did not fear death. In 1987, people of other faiths made an attempt to kill him, because they had a fear that he may turn many people to Christ. Till his last breath, he served the Lord. Memories of Rufus’ sacrificial work still remain in people’s hearts. Joseph, S.J. “Life History of Rev. V. K. Rufus (1942-2003).” In Mennonite Brethren Theological Graduates with Their Life History and Literary Contributions. Compiled by D.N. Purushotham. Hyderabad: G.J. Douglas, 2012. Solomon, E.D., Comp. “60 Samvathsaraala Devuni Krupalo Rev. V. K. Rufus (1942 - ).” (60 Years in God’s Grace in Rev. V. K. Rufus’ Life). Shamshabad: MBCBC & BMBC, 2003: 136-140. Vedulla, Dennis. Interview by author. Shamshabad, India (18 October 2018). Yennamalla, Jayaker. "Rufus, Vedulla Kanakaiah “V. K. Rufus” (1942-2003)." Global Anabaptist Mennonite Encyclopedia Online. November 2018. Web. 22 Apr 2019. http://gameo.org/index.php?title=Rufus,_Vedulla_Kanakaiah_%E2%80%9CV._K._Rufus%E2%80%9D_(1942-2003)&oldid=162518. Yennamalla, Jayaker. (November 2018). Rufus, Vedulla Kanakaiah “V. K. Rufus” (1942-2003). Global Anabaptist Mennonite Encyclopedia Online. Retrieved 22 April 2019, from http://gameo.org/index.php?title=Rufus,_Vedulla_Kanakaiah_%E2%80%9CV._K._Rufus%E2%80%9D_(1942-2003)&oldid=162518. This page was last modified on 30 November 2018, at 19:16.